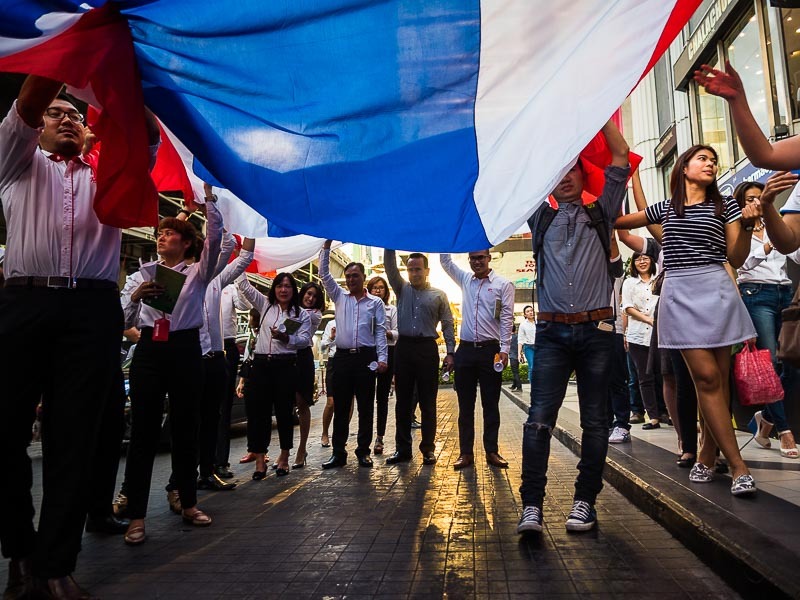 Thais carry their flag along Phloen Chit during a vigil to honor the victims of the Erawan Shrine bombing. 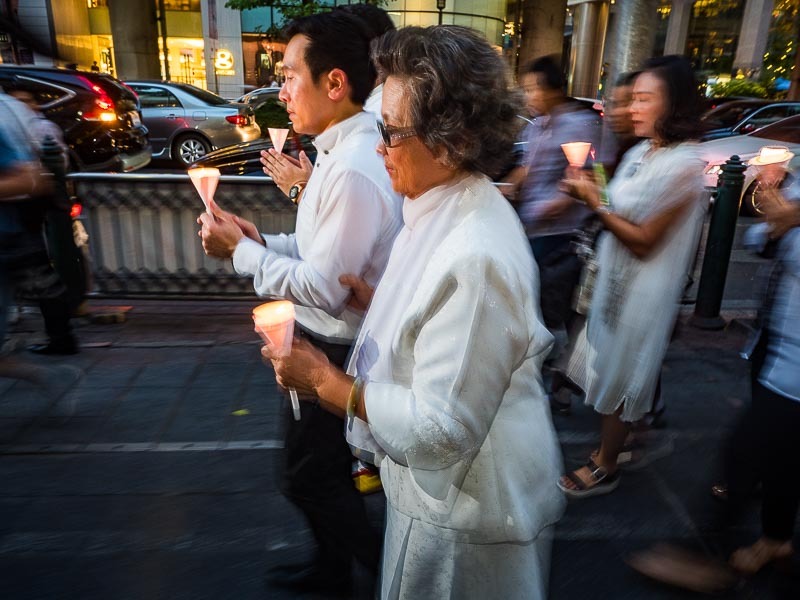 It's been one week since a person or persons unknown set off a bomb at Erawan Shrine in central Bangkok. 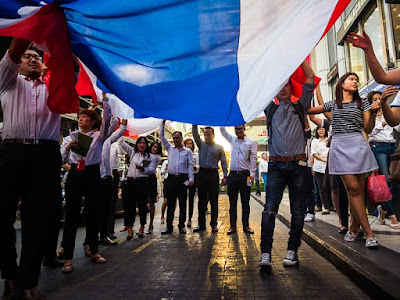 Since then, the Thai government and national police have made a number of confusing statements about the bomber and how soon he or she would be apprehended. Now police are saying it's possible that the bomber, who they think is a foreigner, has left Thailand and that the case has "gone cold." Monday night there was a vigil for the victims of the bombing. The vigil was announced via social media over the weekend but there were no links to the sponsors of the event and the government announced that it was canceled for security reasons. A woman talks to monks before the vigil started. I went down to the shrine anyhow because I wanted to be there one week after the bombing. I wasn't really surprised to see that the vigil was going ahead, without government approval. 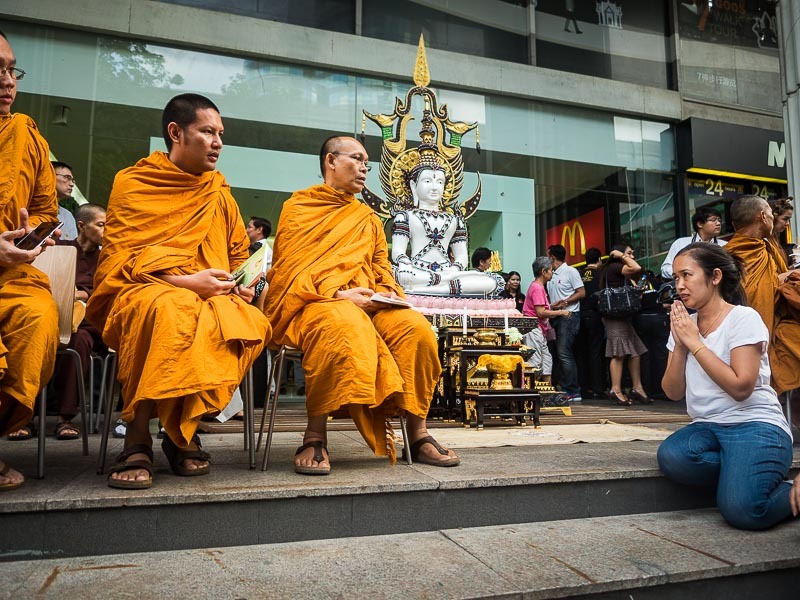 There were five or six Buddhist monks, a few Buddhist nuns and a couple of hundred people in front of Amarin Plaza, one of the malls near the shrine. 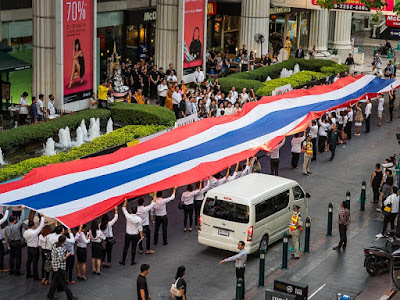 The monks chanted and lead the people in prayer, then people unfurled a large Thai flag. People unfurled a large Thai flag during the vigil for the victims of the bombing. Then they lit candles and walked to the shrine, about 100 meters west of the mall. A monk helps a boy pray during the vigil. During the short walk to the shrine some people prayed, others wept. The procession to the shrine. At Erawan Shrine the monks said some more prayers and participated in funeral rites for victims of the bombing. People lit candles and prayed. 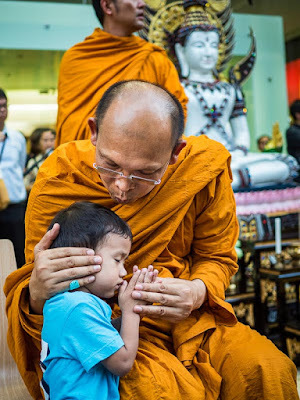 Despite its spiritual importance in Thailand, the shrine is very small. There were well over 100 people there for the vigil, plus the monks plus a large number of journalists. The shrine was packed. 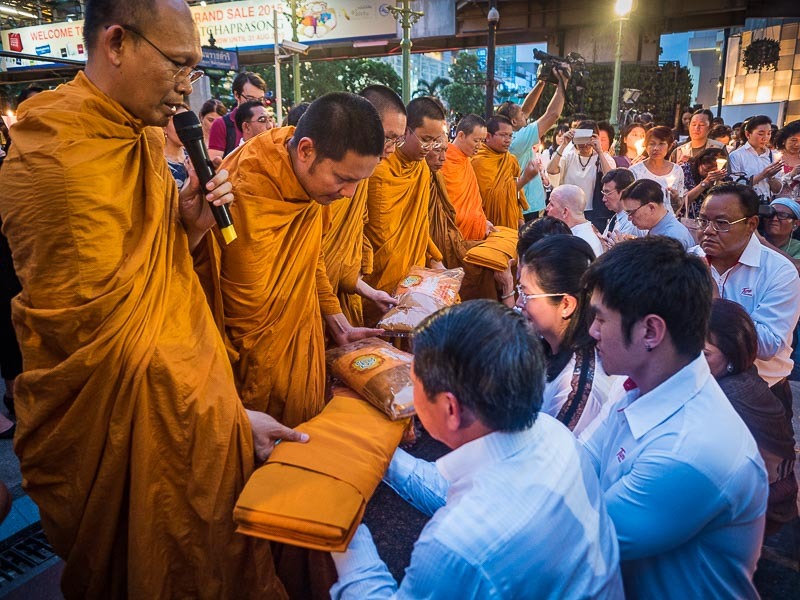 Monks participate in funeral rites for the people murdered at the shrine last week. 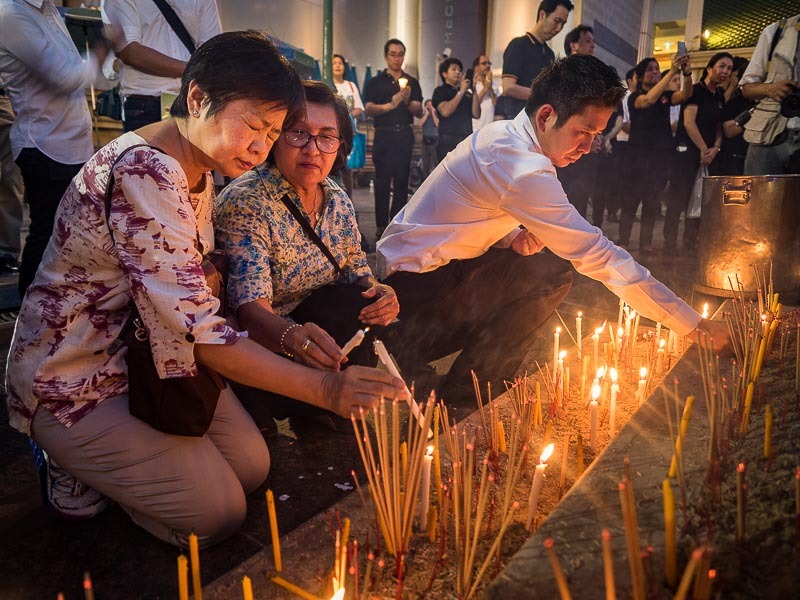 In Buddhist tradition, the one week anniversary of a person's death is a milestone because Buddhists believe that it is at that point, one week after death, that the souls of the departed believe they are dead. People light candles after the funeral prayers. There are more photos from the vigil and the bombing in my archive or available from ZUMA Press.